Aurident offers dental laboratories a full-service milling center for production of exceptional quality restorations at economical prices. 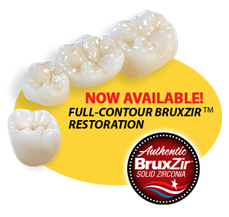 State-of-the-art, five-axis machines and scanners operated by highly experienced zirconia milling technicians use Delta yttria-stabilized zirconia to fabricate single units, bridges, veneers, inlays/onlays, full contour restorations and implant abutments*. 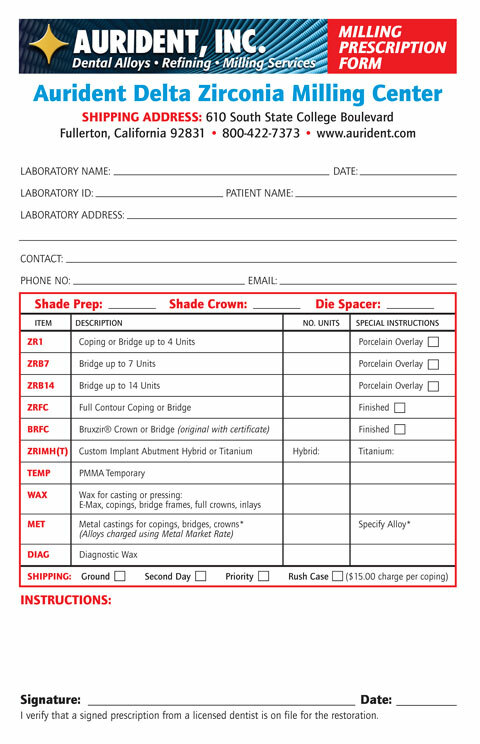 Additional capabilities include milling of temporary crowns, wax copings, and the layering of zirconia porcelain or finishing of full contour crowns. A complete list of services is shown in the following table. Completed cases are shipped at no charge within 3 to 4 business days of receipt. Expedited services and shipping are available. Restorations can be milled from models OR scanned files at a reduced price. 610 S. State College Blvd. Specify if special features are necessary such as linguals and occlusal which will be charged separately. 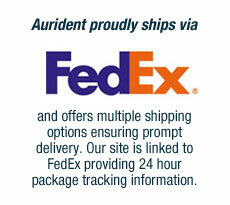 Please indicate whether you require expedited service or expedited delivery (additional charge applies).